, eldest brother of the preceding, was born in 16'67, and admitted in 1680 at Westminster school, whence he was elected to Christ Church, Oxford, in. 1686. While a student there he wrote some good verses on the inauguration of king William and queen Mary, which were printed in the Oxford collection. In, the celebrated dispute between Bentley and Boyle, Mr. Freind was a warm partizan for the honour of his college, but was eventually more lucky with Bentley than his brother, Dr. John. A neice of our author’s was married to a son of Dr. Bentley, who, after that event, conceived a better opinion of the Christ Church men, and declared that “Freind had more good learning in him than ever he had imagined.” Mr. Freind proceeded M. A. June I, 1693, became second master of Westminster school in 1699, and accumulated the degrees of B. and D. D. July 7, 1709. In 1711 he published a sermon preached before the house of commons, Jan. 30, 1710-11, and in the same year he succeeded Duke, the poet, in the valuable living of Witney, in Oxfordshire; became head master of Westminster school, and is said either to have drawn up, or to have revised the preamble to the earl of Oxford’s patent of peerage. In March 1723, the day after his brother, Dr. John, was committed to the Tower, he caused much speculation in Westminster school and its vicinity, by giving for a theme, tf Frater, ne desere Fratrem.“In 1724 he published Cicero’s” Orator,“and in 1728 Mr. Bowyer, the celebrated printer, was indebted to him for the Westminster verses on the coronation of George II. In April 1729, Dr. Freind obtained a canonry of Windsor, which in 173l i he exchanged for a prebend of Westminster, and in 1733 he quitted Westminster school. In 1734 he was desirous of resigning Witney to his son (afterwards dean of | Canterbury); but could not do it without the permission of bishop Hoadly, which he had little reason to expect. On application, however, to that prelate, through queen Caroline and lady Sundon, he received this laconic answer,” If Dr. Freind can ask it, I can grant it." Dr. Freind’s letters to lady Sundon are still existing, and prove that he had as little scruple in asking, as bishop Hoadly had in flattering a lady, who, by her influence with queen Caroline, became for a considerable time the sole arbitress of churchpreferments. 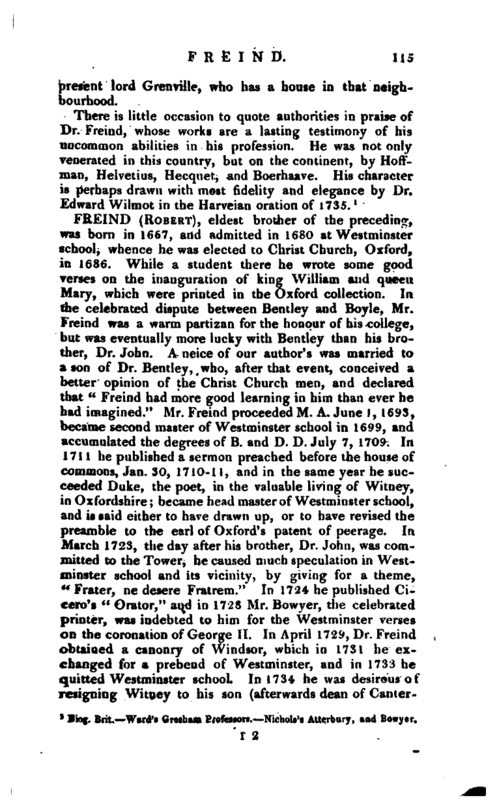 In 1744 Dr. Freind resigned his stall at Westminster in favour of his son, and died August 9, 1751. By Jane his wife, one of the two daughters of Dr. Samuel Delangle, a prebendary of Westminster, he had two sons, Charles, who died in 1736, and William, his successor at Witney, and afterwards dean of Canterbury. 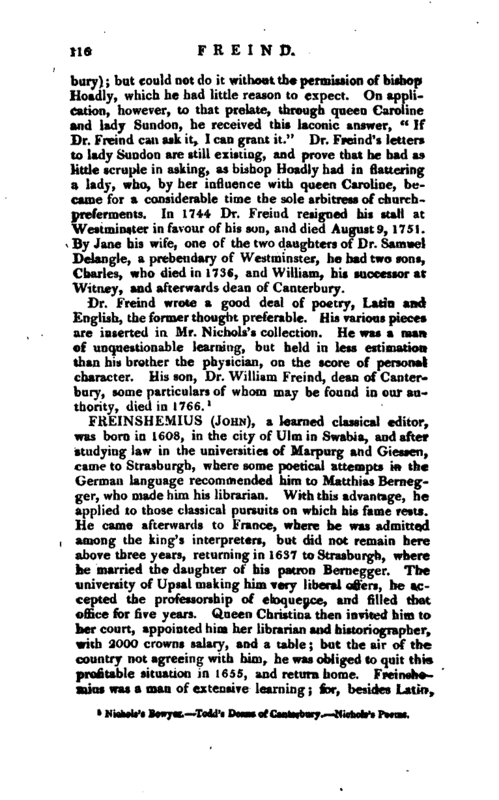 Nichols’s Bowyea Todd’s Deans of Canterbury. Nk-holi’s Pottns.